For 25 Years, Robin Hood has fought poverty in New York City. Blackbird Presents is partnering with The Robin Hood Foundation for “Imagine: John Lennon 75th Birthday Celebration”, an all-star concert event celebrating the music and message of the legendary music icon. To honor John Lennon’s legacy of solidarity and inclusiveness, a portion of the proceeds from the concert will be donated to Robin Hood’s fight against poverty in New York City. Robin Hood is New York’s largest poverty-fighting organization, and since 1988 has focused on finding, funding and creating programs and schools that generate meaningful results for families in New York’s poorest neighborhoods. Since its founding, Robin Hood has raised an incredible $1.95 billion in dollars, goods and services to provide hundreds of the most effective soup kitchens, homeless shelters, schools, job-training programs and other vital services that give New York’s neediest citizens the tools they need to build better lives. In addition, 100% of your donation goes directly to organizations helping New Yorkers in need. In honor of what would have been John Lennon’s 75th birthday, Blackbird Presents, in partnership with AMC, is proud to present “Imagine: John Lennon 75th Birthday Concert”, a once-in-a-lifetime experience celebrating the life, music & message of the inimitable John Lennon. 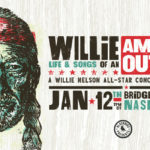 Featuring Aloe Blacc, Eric Church, Sheryl Crow, Brandon Flowers (The Killers), Peter Frampton, JUANES, Kris Kristofferson, Pat Monahan (Train), Tom Morello (Rage Against the Machine), Willie Nelson, The Roots, Chris Stapleton, and Steven Tyler, as well as additional performers to be announced, the concert will be held at the Theater at Madison Square Garden on Saturday, December 5th at 7:30pm ET, and air exclusively on AMC on Saturday, December 19th at 9:00pm ET/PT. Blackbird Presents is proud to bring together fans, friends and music royalty to honor Lennon’s musical legacy, and in partnering with Robin Hood, help provide much needed funds for the very important fight against poverty in New York City. John Lennon loved New York City, and we know he wouldn’t have had it any other way. To learn more about Robin Hood, visit them here. Get all the details about the show here. Tickets are available through Ticketmaster Charge By Phone (1-866-858-0008), www.ticketmaster.com and all Ticketmaster Outlets. Tickets are available in person at the Madison Square Garden, Radio City Music Hall and The Beacon Theatre box offices.